awfully big reviews: THE FLITHER PICKERS and THE HERRING GIRLS by Theresa Tomlinson. Reviewed by Ann Turnbull. THE FLITHER PICKERS and THE HERRING GIRLS by Theresa Tomlinson. Reviewed by Ann Turnbull. These two stories (now newly published in one volume) celebrate the lives of the fishing communities around Whitby. Theresa Tomlinson was inspired not only by the history of these places but by the photographs of working people taken by Frank Meadow Sutcliffe around 1900. Some of his photographs illustrate and enhance this book. Both stories are about families in the same village, and both are about young girls on the cusp of adulthood growing up in difficult circumstances, making important decisions about their futures and gaining a sense of self-worth. In The Flither Pickers Liza, caught up in troubling adult concerns, seeks and gradually unravels the reason for her mother's emotional distance, and begins to develop a closer relationship with her. The Herring Girls, set a few years later, focuses on thirteen year old Dory, whose father has died and whose Mam has become the village washerwoman in order to support the family. When Mam has a stroke the children are in danger of being sent to the workhouse, and will do anything to prevent this calamity. Dory's eleven year old brother joins the fishing fleet, and Dory goes to Whitby to become a herring girl. 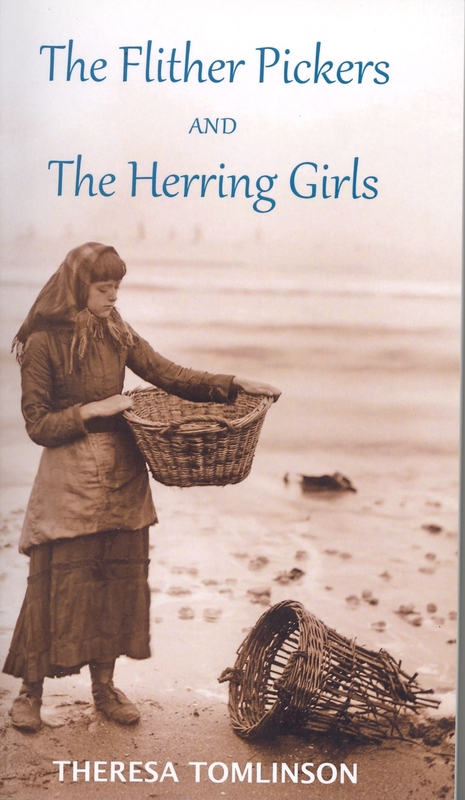 Much of this story is about the hard, skilled work of the herring girls. Dory and her friends learn how to gut the fish, and do it fast - though they can never match the speed of the 'Scotch' girls who dominate the trade. The work is so relentless that the young girls can hardly stand, can't stop to wash or change their clothes, and fall into bed each night exhausted. But they succeed. And by the end of the summer, not only have they made enough money, they've made friends with the Scotch girls - and Dory has knitted her first gansey, for her brother. There are no easy endings in these stories. Liza gets a job as a children's nanny but loses it; Dory's Mam doesn't entirely recover, and Dory must face the necessity of taking on her mother's job of washerwoman over the winter. But somehow this makes for an upbeat ending. And when Dory says, "I'm a herring girl - I can do anything," you believe her and want to cheer for her. The Flither Pickers was first published in 1987 and The Herring Girls in 1994. Since then they have both been through several editions, apart and together. This edition is published by The Old Print Workshop, 2017. Thanks for the recommendation.The use of old photographs to inspire and illustrate the text intrigues me too!